Indian-American Nikki Haley, the outgoing United States Ambassador to the United Nations, has poked fun at Donald Trump’s inflated ego and his cultural ignorance, days after announcing that she would be leaving her position representing America at the world body. Haley, 46, announced on October 9 that she is resigning from her UN post, effective at the end of the year. She has since claimed that she has no ambitions to run for president in 2020. Haley, during remarks at the 2018 Alfred Smith Dinner in New York, mocked the president for getting laughed at the UN General Assembly last month -- a spectacle that both she and the US president said was intentional, New York Daily Times reported. The former South Carolina started the speech with a joke about Trump’s thin skin. “Everyone in Washington called me with advice about this speech. They all said the same thing, do not under any circumstances make any jokes about the president. So, good night everybody,” she said to laughter from the crowd. She also joked about the president’s ongoing feud with US Senator Elizabeth Warren, who recently released the results of a DNA test that strongly supported the existence of Native American ancestry from six to 10 generations ago. “The president called me this morning and gave me some good advice, he said if I get stuck for laughs just brag about his accomplishments. It really killed at the UN, I’ve got to tell you,” Haley said on Thursday night. The outgoing ambassador was recalling a moment during the president’s UN speech when delegates laughed at him boasting that his administration had, in two years, “accomplished more than almost any in the history of our country”. Trump has repeatedly mocked Warren with the nickname for – Pocahontas -- for her having claimed previously that she has Native American ancestry. 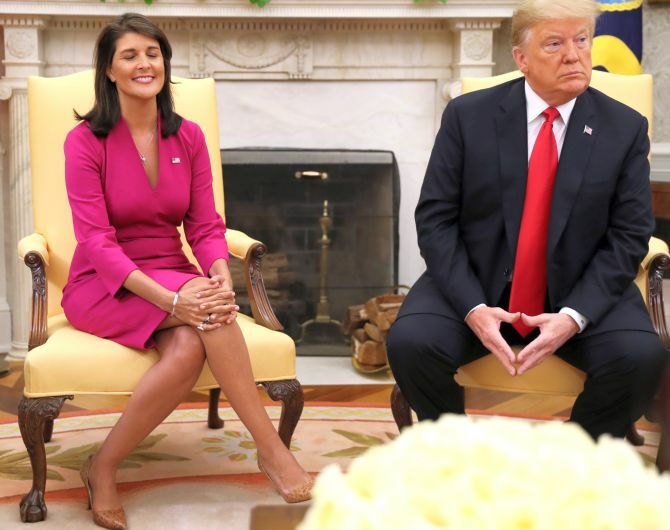 “I get it, you wanted an Indian woman but Elizabeth Warren failed her DNA test,” Haley said in New York. She continued to poke fun at Trump’s cultural ignorance, the report said. The ambassador poked fun at Trump's response to the recent Bob Woodward book.